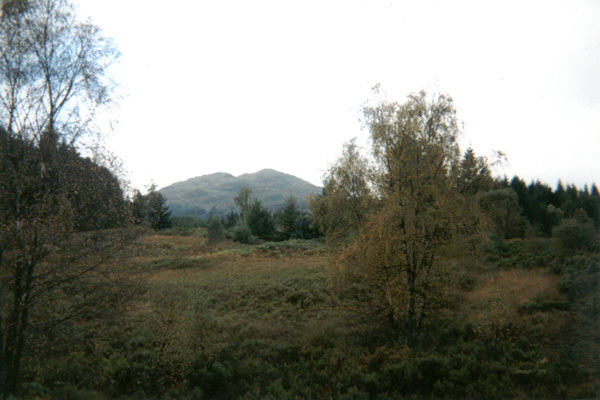 Rising proud from the wooded slopes of the Trossachs, Ben Venue is a rugged little fellow. Dark cliffs and rocky knolls may suggest an air of impregnability, but the fortress-like defences of the peak's summit can be breached if you know where to look. The best place to start an assault is the Forestry Commission car park at the west end of Loch Achray. 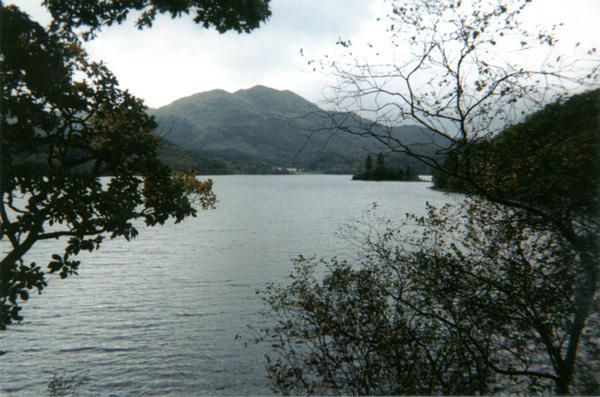 From here, walk south along the A821 road for around 400 yards to the entrance to the Loch Achray Hotel. Turn right here, following a wooden signpost for Ben Venue, and wander up the drive towards the hotel. To the rear of the complex join a forest track that crosses a burn then heads west, following the Achray Water upstream. A short way on a fork in the track is reached. Bear left here and follow the track to a crossroad a short way on. Go straight on, climbing up through the trees, the track narrowing into a path. There are some fairly muddy sections during this part of the ascent but stepping-stones are to be found over some of the dampest patches. Further on another track is joined. Cross over and continue up a track as the way climbs through Gleann Riabhach. When the track ends a path leads to the top of the plantation, emerging on to open hillside. The route bears north at this point, climbing up under the crags of Ben Venue to reach a col on the ridge. At this point, the path bears right, climbing over the west shoulder of the peak, then, just before a prominent cairn, it curves right again before the trig-point on the summit is finally reached. Standing at 2391 feet (727 metres) high, Ben Venue offers spectacular views north over Loch Katrine - Glasgow's water supply - and the Trossachs, and east over Achray Forest and Loch Venachar. There are two options for your return. The most straightforward is to follow the route of ascent back down to the car park. Alternatively, to create a circuit, return to the prominent cairn on the ridge below the summit and, at this point, bear right and head down into the gully below. This route needs careful navigation and caution should be taken when descending the slope. Cross the stream lower down and continue to descend, contouring round over the ridge towards a line of fence posts coming down from the right. You will have to bear left away from the posts to walk under some rocky knolls but below these curve right to head east to reach the top of a gully where the route descends alongside the fence line towards Loch Katrine. As the steep gradient begins to ease, pick up a path on the right that leads back to the forest. Back within the trees a good track leads back to the hotel. Start Forestry Commission Achray public car park (grid ref 505068). Parking Free parking at the start. Grading An energetic climb through forestry and over open hillside best suited to hillwalkers and older children. Paths in the trees can be wet and muddy. Returning by the route of ascent is the easiest option, but walkers who are confident of their navigational skills over open hillside can make a circuit of the route.